A modern ratemeter that gives you all the information you actually need in the boat, without gimmicks or complex displays. 10 memory sessions [ Rate and Time are stored at 12 sec intervals for recall] up to 85 mins total. This means you can store up to 10 races or training pieces before you start to overwrite the first one. To replay you select the piece of rowing to recall and then scroll or index through the data. Very useful in heads or races for getting a quite accurate race time. *Semi automatic operation with Countdown start if required or just start rowing to start clock after manual start up.,* Auto stop after 3 secs of not rowing. *Auto switchoff after some 5mins of non use- or manual switch off . Battery life is 5yrs plus, depending on use - see note below. You should not really need to worry about the battery for many years, unless misused. Velcro for universal mount on boat stretcher etc. Robust Waterproof rubber plug connector. Lithium Coin cell type battery , Neck cord available if required. Extra sensors available. Free Battery change - for the first 5 years we will replace, free of charge, the battery, if unit is posted to us from theUK. We can do this because a change should not be needed in that time! If you wish to change it yourself we will gladly give details. [Cost after 5 years is £5 inc post]. Note:- If a non working unit is sent back to us for a new battery and some other fault is then found [ outside warranty], there will be a charge made - quote given before proceeding. Battery replace: Free [see note] or after 5 yrs £5 inc post if fitted by us. Automatic start and shut down- uncomplcated, foolproof operation. Waterproof and they float ! Uses normal slide switch input, Fully automatic start and shut down, no buttons at all. Just fit and row. Available with plug for quick removal from boat, or permanently wired to sensor. Ideal for your own or club boats. Attaches to the handle of the blade via a velcro strap and has no fixing to boat at all. 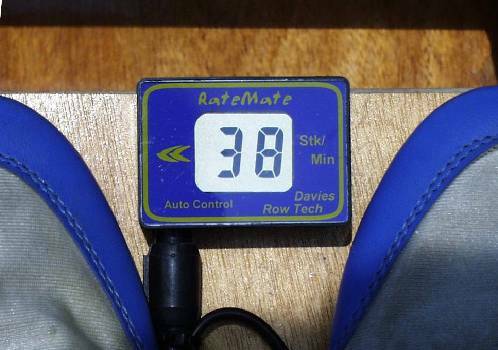 An economical, simple, robust, handy unit, Ideal for rowers who often change or borrow boats . Suitable for fixed seat boats. Strap to wrist for carrying when not on blade handle. NOTE:- DOES NOT work on 'square blade' paddling!, and may give false reading in very rough water. NOTE, the RateMate after Oct 2005 has a different plug to earlier units. If you require one with the earlier plug they are still available on request at £48. Similarly the sensor plug is different too, but available at same price as now. Please ensure you mentionolder type if ordeing replacements for the units. We do still carry spares and can repair ALL previous DRT produced ratemeters plus spares and some repairs for Cadence FC and early NK 'Stroke coach' ratemeters too. Please contact us for availability and prices - We do not charge 'rip off' prices. Similarly we can supply instructions Free for ALL our RateMeters - email us.